Dull hair is revived with Hair Recipes Egg & Cognac Shampoo! Egg & Cognac Shampoo - 200ml - $14.95 - with a sulfate and paraben free formula that energizes hair follicles with a high dosage of naturally based protein with each use - for hair that is stronger that is less likely to break or develop split ends. Egg Yolk Conditioner - 200ml - $16.95 - for hair that is softer, silkier and more manageable while adding strength thanks to the proteins found in egg yolk. The best thing about using eggs on hair - the amazing shine - making it great for dull, tired, lifeless looking hair - eggs maintain the hair's natural oils, which most regular shampoos strip away. I admit, I was a little leary of trying it - I am not a fan of eggs - I don't like the way they taste and I hate the way they smell so I wasn't going to be able to deal with something egg-scented on my head - not to worry, the scent isn't the least bit eggy but more on the sweet side and I have to admit, it really does bring the shine! 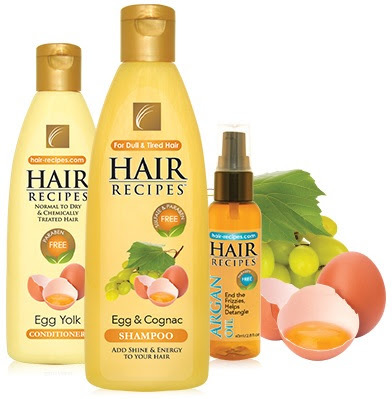 And right now Hair Recipes has a special deal of the Egg & Cognac Shampoo + Egg Yolk Conditioner along with a free Argan Oil (an $18.95 value) for a limited time only $28.71! Just keep in mind that all prices are in US $. Check out the website for this and other deals and information - including lots of home made hair recipes like the egg and Argan Oil one: Take 1 raw egg & 2 to 3 tablespoon of Argan Oil (depending on length of your hair) and mix together in a bowl. Massage into wet scalp and hair. Wait 4 to 5 minutes. Rinse with cool water. Hot water will scramble the egg and it will be hard to remove. Repeat rinse with warm water. Shampoo with Egg & Cognac Shampoo and again rinse with warm water. Egg adds vitamins, minerals, and essential fatty acids to the hair. Repeat after every 6 to 8 shampoo washes. Available exclusively online at www.hair-recipes.com.